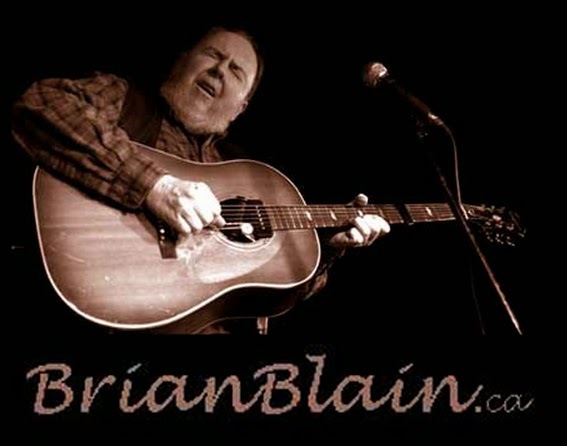 Originally from the hills of rural Quebec, now based in Toronto, Brian "Colorblind" Blain has been performing his unique brand of slow-cooked, solid-groove folk blues for more than 40 years - soulful, thoughtful, always entertaining. Brian is the quintessential 21st century northern bluesman - a study in contradiction, starting with the title of his new album, "Overqualified For The Blues". His guitar style is as authentic and soulful as you will find in any blues - south, east, west or north - but his lyrics reveal a unique, contemporary point of view. His vocals do not sound like some old blues guy, yet he is an old blues guy, with 60 years of life experiences and 40 years writing and singing about them (on the same guitar). His lyrics are thoughtful but he's an entertainer at heart. Brian has played all kinds of music from classical to rock but has come full circle to where he started, the folk blues. He has worked in just about every aspect of the music business on stage and behind the scenes as a recording artist, sideman, producer, manager, music writer/editor, publisher, director and tireless promoter of Canadian blues artists. Ever since his 1973 recording, "The Story of the Magic Pick"(Good Noise/Polydor), Brian has been providing his wry commentary on the music scene. On this album, "Blues is Hurting" is Brian's take on the blues scene today and "One More Weasel" is a cynical swipe at the music industry from this otherwise mild-mannered Buddhist bluesman. On "Hi-Tech Blues," a song about his trials and tribulations with computers, Brian is backed up by the rhythm section of Canada's premiere blues band, Downchild. West-coast blues phenom Harry Manx plays on the anthemic "Peace" and invited Brian to open for him on three Ontario tours. Montreal-based multi-instrumentalist Michael Jerome Browne is featured on four tracks including "No More Meetings"(surely the first blues song to rhyme "decorum" with "quorum"). Brian's biggest boosters have always been the musicians he's come to know both on stage and behind the scenes. It was bassman extraordinaire Victor Bateman who convinced him to demo some of his original tunes after they jammed together at Brian's 50th birthday party. This led to the 1999 release of his indie CD "Who Paid You To Give Me The Blues?" Now, as he approaches his 60th, Brian is determined to spend less time in front of a computer and more time playing guitar. Since arriving in Toronto from rural Quebec in 1990, Brian has been performing locally as a solo artist, occasionally teaming up with Scott "Professor Piano" Cushnie, Suzie Vinnick or Paul Reddick and he even had the opportunity to play gigs with blues luminaries Gene Taylor of the Fabulous Thunderbirds and the late Long John Baldry. On occasion he's assembled a full-blown blues revue called "Colorblind Brian and the New Blainettes" featuring the all-star backup band from Toronto's Women's Blues Revue. His year-long residency at Toronto's Tranzac Club featured a succession of Canada's greatest blues artists, Morgan Davis, Michael Pickett, Carlos del Junco, Madagascar Slim, Papa John King and many others. His after-hours blues jam at the 2005 Toronto Downtown Jazz festival had jazz stars Antonio Hart, Russell Malone and Roy Hargrove sitting in. Brian's early exposure to the blues consisted of one weekly radio show on French CBC radio, a reel-to-reel tape of Rev. Gary Davis and a mail-order instructional LP called "The Art of the Folk Blues Guitar" He learned every tune in the book and he still plays some of those songs today...on the same guitar! Following a stint in Ontario as a junior copywriter at an ad agency, he returned to Quebec, playing with and producing records for two pioneering groups that blossomed in the late 60s from the hills of Quebec's Eastern Townships. Fraser & DeBolt re-defined (or at least expanded) the term "folk music" and Oliver Klaus, was probably the first "indie" band in Quebec to have their own studio and press their own records. As a solo artist, Brian recorded a single in 1973 on Good Noise/Polydor, and performed with a back-up vocal group called The Blainettes, opening concerts for Lou Reed and Seals & Crofts and stopping the show at the legendary James Bay Benefit Concert that featured Loudon Wainright and Joni Mitchell. The recording featured members of the Mothers of Invention and the Manhattan Transfer, Tom "Bones" Malone and legendary drummer Jim Gordon (Derek and the Dominoes). "I’m a 60-year old white male baby-boomer singer-songwriter and puveyor of modern acoustic blues. I’ve got a new CD and I’m trying to get out there and play for the people – and when I do, they definitely enjoy what I’m putting down. With the encouragement and support of many highly respected players, I've recorded this CD, "Overqualified For The Blues" and have been doing some limited touring. I also work behind the scenes in the music business as an editor/writer and my tunes provide a tonge-in-cheek commentary on the scene I live and work in. Some of my tunes like “Blues Is Hurting” and “One More Weasel” might be regarded as “biting the hand that feeds me,” but you’ve got to write what you know, eh? My biggest boosters are the musicians I've played with in Toronto. I think they like my playing because I’ve got something all my own. My guitar style has developed very slowly and naturally over the course of 40 years. It’s a simple finger-picking blues guitar style with few chords and lots of open strings. I've never used alternate tunings. Never played slide. Practice is an alien concept to me. The closest thing to a guitar lesson that I ever had was an instructional book/record called “The Art of the Folk Blues Guitar.” And 40 years later I’m still playing those licks (on the same guitar, too).